As it turns out, it's also important in other parts of the country. Groningen is a university town so it's not surprising to find bikes there. 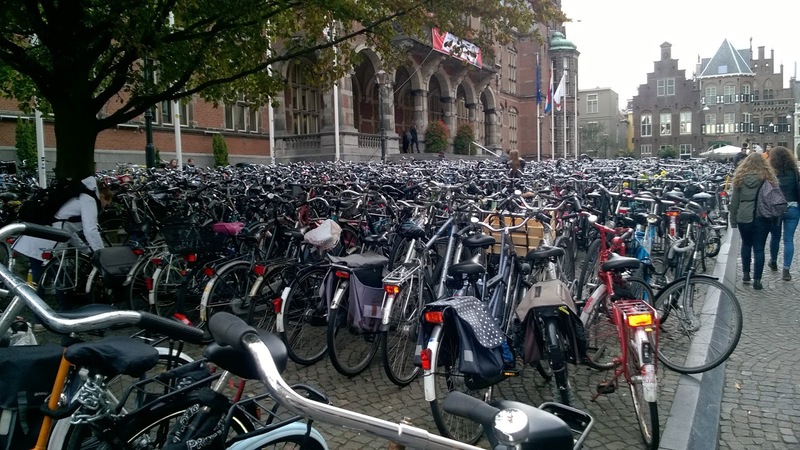 But I can't think of any American university, even in bike friendly college towns like Portland, Oregon, where you would find the number of bikes that you see at Rijksuniversiteit Groningen. But the Dutch not only put their bikes to pragmatic use for shopping, commuting, and such. They also have their fun bikes that they use for touring and cycling through the country-side. twists or turns. But as I rode, I noticed there were no bridges. How, I wondered, did one get from one side to the other? Surely there must be a bridge at one of the upcoming small villages. First village, no bridge. Just water between me and the other side where the town lay. I checked my map and it looked like the next town wasn't very far up the road so I decided to keep going. Surely, I'd find a bridge somewhere along the way. Traffic was very light. Only a few cars going in either direction passed me. Looking out over the countryside, I could see for a very long way. The amazingly flat countryside went on and on. It's not the same as the plains in the American west or at least it felt different to me. On the plains, you can feel insignificant and very small. Driving can be unremittingly boring. The Netherlands polder didn't carry the same sense of space or loneliness. Perhaps it's because the country is so densely populated that there is an awareness of human proximity. I kept peddling along and starting to get a bit worried about finding the bridge to the other side of the canal. I passed beside Watergang and was coming up on Ilpendam when I came to an intersection. Another cyclist came to the intersection just before me, stopped his bike beside a pole, and pressed a button on the pole. Then he waved his arm over his head. He was waving at a boat on the other side of the canal. The way to get across the canal was not by a bridge but with a ferry. I pulled up alongside him and pretended I knew what I was doing. The sign on the pole said that it cost 70 cents Euro to get across with a bike. 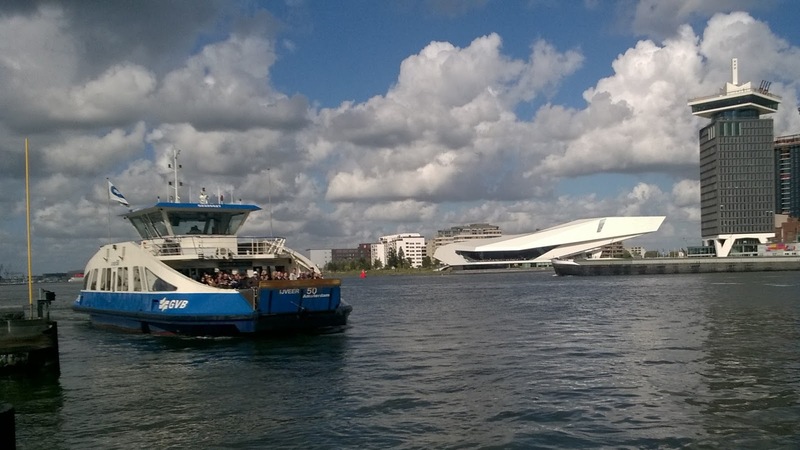 In a few short minutes, the ferry had crossed the canal and we two cyclists boarded, paid our 70 cents and were soon deposited on the opposite shore. It was a lucky break to have that other guy come along when he did. I could still be riding north looking for that bridge across the canal. On my way back to Amsterdam, I wanted to check out the Eet 't Dijkhuis restaurant. Amanda and I had heard about it when we rented bikes but hadn't had time to come looking for it. 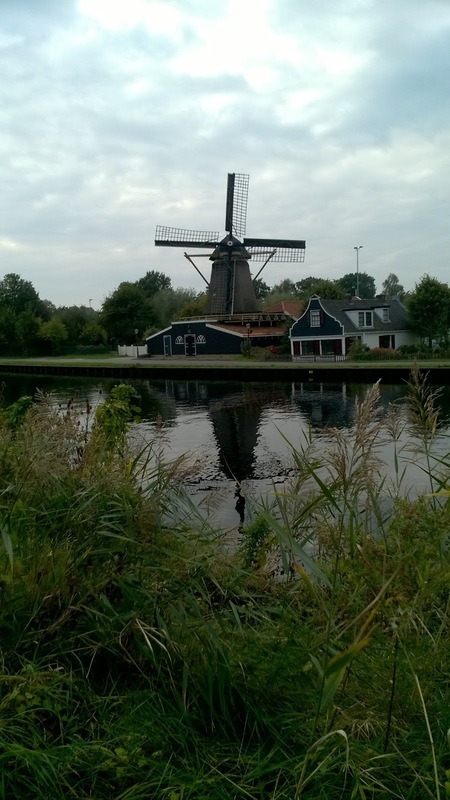 After a side trip through Broek in Waterland, a lovely little village that I got to by riding along the top of another dike, I found the restaurant. Alas, it had closed a couple weeks earlier and was awaiting new owners to take over. 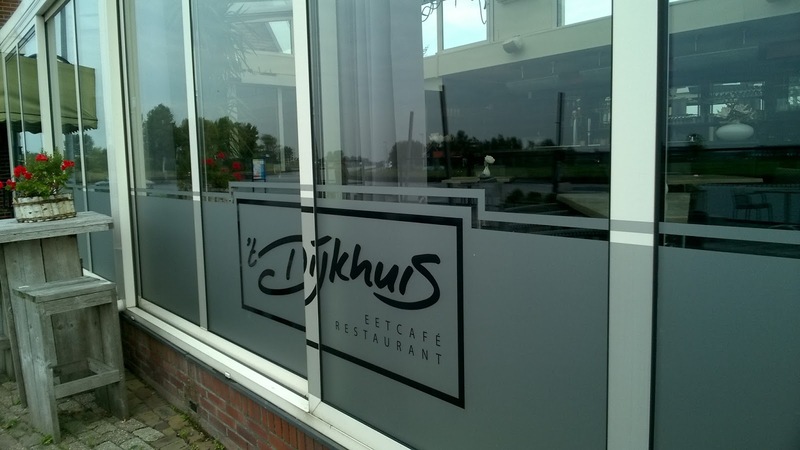 So there was to be no visit to the Dijkhuis restaurant this trip. By this time, it was getting to be late afternoon and the setting sun meant the temperatures were cooling rapidly. Time to get back to Amsterdam.